Hundreds of colleges across America have various statutes representing their campus all around their perimeter. College students typically walk by thinking nothing of it other than its a representation of the school’s idol, however, at The University of Cincinnati, this is not the case. 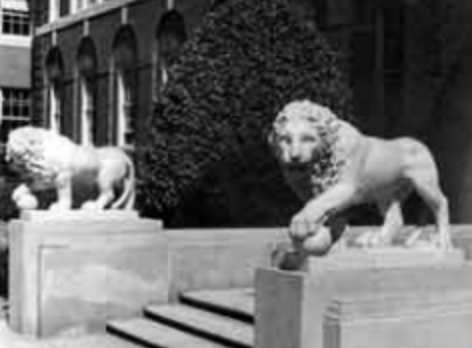 It has become a frequent tale told to incoming freshman that the two extravagantly sculpted lions; that are perched up at the entrance of McMicken hall are possessed. Originally owned by Jacob Hoffner and his wife Maria Hoffner who were wealthy landowners donated the two loins Mick(left) and Mack(right) to UC in 1904 after their death. Various college students strongly believe the lions come to life when the sun sets. A variety of students have heard growling and roaring coming from the directions of the lions as the walk by. Some have even claimed to have seen lions head rooted in different positions as the days progress. There is no reason has to why this lion could possibly be possessed so the lions of Cinincinatti will continue to be an Urban Legend.